The sequel to 2014’s small-yet-profitable animated picture The Nut Job has some small hurdles to conquer to not be insufferable. There’s no convoluted plot of animals swiping nuts from a nut shop that overlaps with a mafia-front operation to rob a bank. There’s no stopping of the movie to showcase the popular music talent of the moment, as the previous film did with Sy. There’s no simplistic and juvenile fart joke, complete with green vapors. The Nut Job 2: Nutty by Nature does away with these mistakes and replaces them with a standard and forgettable plot of CGI animals. Oh, and dogs eating puke. This is a film that is all about taking the easy route in every aspect, from story to comedy to animation. Surly (Will Arnett) is still basking in the glow of having ensured a lifetime supply of food for his city park brethren with the contents of an abandoned nut shop. No longer fearing they’ll run out of food, the collective take it easy and shirk their forging skills for nut eating competitions. Of course, the nut supply will not last them forever at this rate, and the shop will most likely be demolished or remodeled soon. But since we don’t have time for that, the shop blows up and the animals find themselves once again terrified about where their next meal will come from. The more resourceful squirrel, Andie (Katherine Heigl), isn’t fretting, as she has been keeping up on her food collecting and is willing to share her natural strategies with her animal friends. Things were starting to look up for this picture with a strong theme about nature, but then were quickly muddied up by a plot development most bland. A typically tubby mayor (Bobby Moynihan) wants to shut down the park and exterminate all the critters within to build his own money-generating amusement park. He could have been a funny villain if only he had more to do than talk about bribes, money, and his hatred of animals with all the laziness of a Saturday morning cartoon villain. His bratty daughter is just as forgettable. Peter Stormare could have made for the best antagonist of the evil exterminator, Gunther, but is strangely underutilized. How can you hire Peter Stormare to do a voice have him sound so bland? That’s a special level of terrible voice direction. But wouldn’t the citizens protest such a decision of their mayor, especially when his method of clearing the park is to blow up large chunks of it with dynamite? The citizens are apparently apathetically accepting of or agree with the mayor’s methods, as with a pair of golfers that seem determined to murder fleeing critters on a golf course with glee. There is not a single human to sympathize with in this picture, let alone one that acts like a human being and not cartoonish obstacles for the critters. It’s so surreal to watch the mayor of a city get rid of rodents from his balcony with a shotgun. The park animals don’t fare much better, though they do have stronger arcs. We learn a little more about the history between Surly and his mute friend, Buddy, leading towards the film’s only and lame attempt at tragic drama. 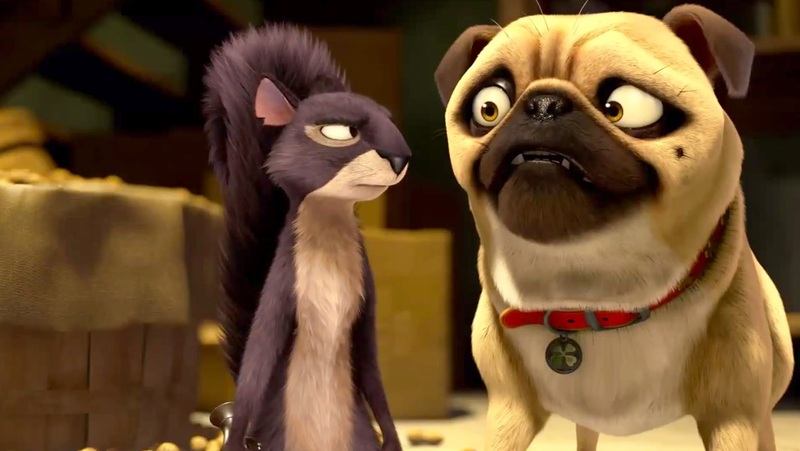 The park pug, Precious (Maya Rudolph), pretends to fall in love with the mayor’s dog, Frankie (Bobby Cannavale), only to start genuinely falling for him over sharing vomit. There may something worth saying about a romantic scene over consumption of puke, but it’s certainly not clean. The movie briefly snaps out of its routine animated antics when Jackie Chan is introduced as a kung fu mouse of the Chinese part of town. I loved his backstory of having led his mouse brethren out of the park-turned-golf-course and training them on Jackie Chan movies to defend themselves. I love his style of combat that involves him floating on his balancing tail and working collectively with other mice to turn themselves into a swarm of fury. Chan’s character has been marketed heavily for this movie and yet he’s only in the film for three brief sequences, stellar and well-choreographed as they may be. 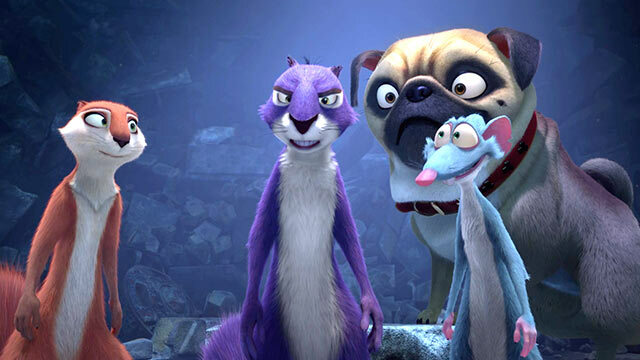 Outside of the two instances of dog vomit, there’s nothing to be offended by or appalled with in The Nut Job 2. There’s also nothing of value, either. Whatever message there may have been is lost within gags that fall flat, characters that are not memorable, and explosive chase scenes that are anything but fun. It’s so formulaic with its premise that it should have been doomed to video-on-demand, if not for the notable voice talents and animation decent enough to be in theaters. 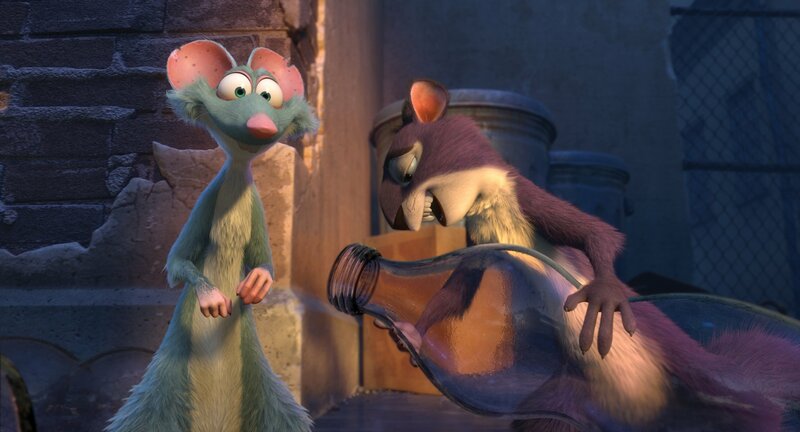 Nutty by Nature is dull by design, gross by gestalt, and boring by box-office expectations. Here is hoping The Nut Job 3 will head straight for home video and bypass polluting theaters once more with doggy farts and puke, as we know what bodily function will follow next.